The Olive-backed Euphonia, Euphonia gouldi (formerly known as Olive-backed Tanager) is a Central American finch whose name commerorates John Gould, the English ornithologist. The Olive-backed Euphonia is found in the Caribbean lowlands and foothills from southern Mexico to western Panama; where they inhabit wet forests, tall second growth and adjacent bushy clearings. They are typically seen at sea level to 750 m altitude - occasionally up to 1000 m.
The Olive-backed Euphonias usually occur in small groups, or are part of mixed-species feeding flocks. The Olive-backed Euphonia averages 9.5 cm in length and weighs around 12g.. The adult female's plumage is less glossy than the male's. She is yellow below and has a small rufous patch on the abdomen. Her forehead is chestnut-colored. Immature birds are generally darker, duller, and the plumage is olive below. Olive-backed Euphonias feed primarily on small fruits, particularly mistletoe berries; and they tend to move to places where mistletoe berries are the most abundant. 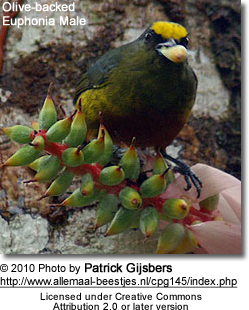 Interestingly, the mistletoe plant is poisonous, but the Euphonia's gut is specially adapted to handle the toxins. Euphonias are important to the mistletoe plant, as they help them reproduce. As their seeds pass through the bird's digestive system, the droppings land on branches or the ground, and grow into new plants. They construct a spherical cup nest with a side entrance. It is usually hidden amongst epiphytes or mosses, about 2 – 11 m high in a tree. The average clutch consists of three brown-marked white eggs. The Olive-backed Euphonia’s call is descrived as a metallic chrrr-chrrr. Its song is mixture of the call with clear or nasal whistles.